During a press conference this morning and an appearance on Outside The Lines, Thunder center Enes Kanter provided more details about his brief detainment in Romania yesterday. 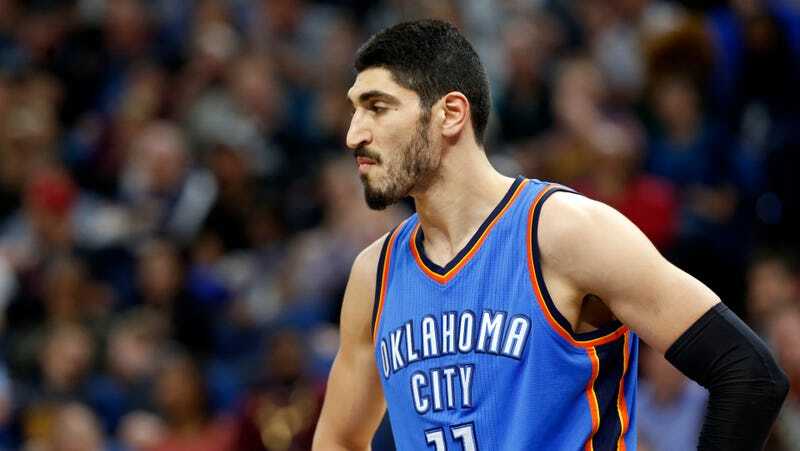 Kanter was held at the airport in Romania by police officers after his passport was canceled by the Turkish government. In a video posted to his Twitter feed yesterday, Kanter explained that his passport had been canceled because he has been an outspoken critic of Turkish president Recep Tayyip Erdoğan. Kanter was eventually allowed to fly to London, and has since returned to the United States. Kanter, who had been broadcasting his whereabouts on social media promoting his charity work with his foundation, said he and his manager fled to Singapore on the first flight out. “We kind of escaped the country at 5:30 a.m. and we went to Singapore and then we went to Romania, and that is where the madness started,” Kanter said. Kanter says that he is now a man without a country, and hopes to become a United States citizen as soon as possible.